The T28-B is the US Navy version of the T-28 Trojan piston-engine training aircraft developed by North American Aviation in the late 1940s. The T-28B version featured a 1,425hp Wright Cyclone radial engine, Hamilton 3-blade propellers and belly-mounted speed brakes that greatly improved the plane’s speed and manoeuvrability. It, however, retained the roomy cockpit, tricycle landing gear and huge flaps that come with the standard T-28. A total of 489 T28-B Trojans were built from the mid-50s to the mid-80s, serving as a trainer for US naval aviators as well as a counter-insurgency aircraft during the Vietnam War. Today, the Trojan is more recognized as stunt and aerobatics planes in air shows around the world. Though it started out as a trainer and roamed the jungles of Southeast Asia, the T28-B Trojan has now become a fixture in air shows worldwide. 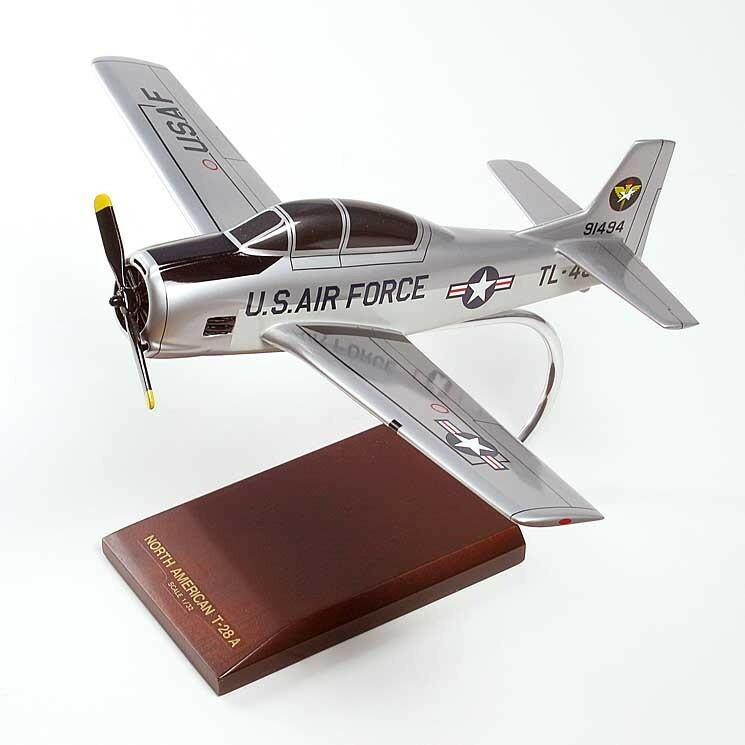 And you too can have this rugged, nimble aircraft in your living or office space with the T-28A Trojan 1/32 scale model aircraft. Each 1/32 scale replica is made from the finest kiln-dried wood, and is chiselled and sanded to match the dimensions of the Navy B variant of the North American T28. Get yours today and experience the thrill and history this icon of American aviation can provide.